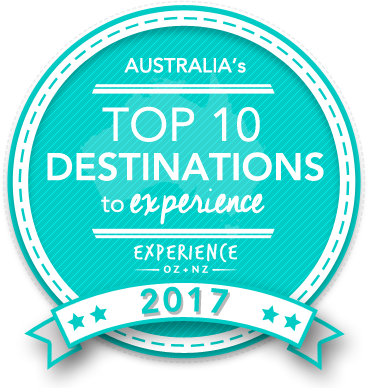 Australia'sTop 10 Destinationsto Experience 2017 Which are Australia's must-visit destinations? You help us decide. An annual celebration of Australia's must-visit travel destinations for 2017 and beyond. Each year, Experience Oz joins with the public to pour over some of Australia's most acclaimed - and underrated - travel destinations to determine the most essential to visit if "money were no object." They're the regions that encapsulate the best of what makes Australia great, from stunning island environments, to fiery red slices of the Outback, to verdant regions teeming with quality food and drink, and much more. In Australia's Top Destinations to Experience 2017, we take a detailed look at the best Major, Regional and Island destinations that best encapsulate the spirit - and incredible experiences - of our sunburnt land. Cast your vote for the chance to win an epic adventure to one of the winning destinations! 1. Uniqueness of Experiences Does the destination offer some wonderful, unique experiences that can't be done anywhere else in Australia and - possibly - the world? 2. Natural Highlights Does it showcase Australian nature in some form, whether it pertains to wildlife, flora, or simply breathtaking landscapes, sunsets or skies? 3. Man-made Highlights Does the destination have distinct architectural features or entertaining attractions that help set it apart? 4. History & Culture Does the destination offer a unique or enlightening take on either Australia's indigenous or European - or both - past? 5. Food & Wine Is the destination renowned for outstanding gourmet food, wine, or other culinary delights? Is dining an "experience" there, rather than just part of the daily routine? 6. Desirability Perhaps most importantly: if money were no object, would you rather visit this destination than anywhere else in its category? Destinations are divided into categories which best reflect their combination of population and inbound visitor volume. Select a category below to view the nominees. Category 1Major DestinationsVote Now The flagship destinations that embody everything Australia. This category encompasses the cities and major travel destinations that first spring to mind when thinking "Australian travel experiences". They’re the big-name travel spots and larger hubs of civilisation that Australia has to offer which you’ll often see populating billboards and tourism campaigns highlighting the best of our country. As flagship spots with a host of unique experiences, each makes for an essential visit at least once in any Aussie’s lifetime. Trendy and upcoming, South Australia's capital continues to revamp its city centre, while still serving as the ideal gateway to a number of top South Australian day trip destinations nearby. Full of heritage both in its landmarks and architecture, Victoria's regional city of Ballarat is both history-rich and home to a number of distinctive attractions that help set it apart. Perhaps Australia’s most up-and-coming capital, Brisbane has seen continued fast growth over recent years yet still manages to provide one of the best balances of urbanisation vs. nature. Adjacent to both the stunning Great Barrier Reef and a short drive from the likes of the Daintree Rainforest, Cape Tribulation and more, Cairns is a renowned haven for experiences on both land and water and widely regarded as Australia's "adventure capital". Far more than just a city of politicians, Canberra in the ACT is the central hub of the nation. It’s a modern city that is proud of its rich cultural heritage with an emphasis on experiences that are both historical and educational, coupled with some great surrounding nature. If there’s any capital city that sums up the essence of what "true" Australia is all about in many people’s eyes, Darwin would likely be it. The city and its surrounds is simultaneously a link to the past – full of culture, indigenous & WWII history – while also one of the most modern capitals in Oz. Far more than just an extension of Melbourne, Geelong and its surrounding Bellarine Peninsula region offer many things that Melbourne itself can't; think quality beaches, pleasant seaside towns and lovely waterfront areas. It's where Melbournites go for a dash of sunshine and seaside relaxation. When the topic of holiday destinations in Australia comes up, the Gold Coast is always one of the first to spring to mind. With a cavalcade of beautiful beaches, a famous nightlife, theme parks and attractions, and some great greenery all in a package that includes amazing weather, it’s not hard to see why the city ranks highly. Combining the old and new with the green and the blue into one highly enjoyable package, Hobart is a delightful city that walks a delicate line between maintaining its historical roots while serving as home to some of Australia’s most modern attractions. It's renowned Oz-wide as a great mainland alternative. Your #1 voted Top Destination to Experience for 2015, Broome and its surrounding Kimberley region encapsulate the term "Aussie escapism". Secluded, escapist and ruggedly beautiful, it's is an off-the-beaten-track destination that features a blend of stunning sunsets, pristine beaches, and incredible landscapes. Blending together the best elements of river, coast and aspects of a tropical oasis, Mackay is an ideal destination for travellers looking to combine some of Queensland's best assets in a single location. Visitors to the region can enjoy many other highlights that push the region far beyond the status of "just a mining town". Second to Sydney no more, Melbourne has continually grown and evolved over the years and has now placed itself firmly on the international stage as one of not just Australia’s top cities, but those in the world as a whole. Annually ranked among the world's most liveable cities, its positives may just make it Australia's best. This under-the-radar harbour city doubles as New South Wales’ 2nd largest, and is the epitome of urban development coexisting alongside numerous sections of wonderful beachfront. As a result, those who love the beach but want all the modern convenience of a large city will be in their element here. Perth is a modern city that’s increasingly growing, pleasantly open and nature-rich and benefits from perhaps the best weather of any Australian capital. Bordered on one side by the waters of the Swan River and an abundance of green Aussie bushland on the other, Perth is a city of contrasts with an excellent standard of living. Known for its beautiful weather, great beaches, fun attractions and plenty of wonderful outlooks, Queensland’s Sunshine Coast more than earns its name. Combine all its natural positives with its strong activity and all-ages entertainment options, and you’ve got one of Australia’s most family-friendly destinations. Both domestically and abroad, when someone attempts to conjure up an image of “Australia” they are likely to come up only a few possible destinations that immediately spring to mind – and Sydney is nearly guaranteed to be one of them. More than just a bustling metropolis, Sydney is one of the beautiful harbour cities of the world. Townsville and its neighbouring Magnetic Island are something of a hidden gem in terms of Australian travel. Located on the tropical QLD coast with universally warm weather, it's a destination that's far less crowded than some of the similar, more commercial destinations. Pay the region a visit today and grab a slice of heaven all for yourself. As the 2016 and 2013 winner of Australia’s Top 10 Destinations to Experience as well as runner-up for 2014, the Whitsundays is a much-acclaimed destination that symbolises what an island getaway is all about. With a postcard-perfect scene awaiting around every corner, it’s a favoured destination of honeymooners & holidaymakers alike. Category 2Regional DestinationsVote Now The hidden gems and top getaway spots that are likely right near you. This category encompasses the many hidden gems and smaller-scale holiday hotspots around Australia. Smaller in size yet no less big on character, Australia's regional destinations offer some of the most unique landscapes and charming experiences our country has to offer - without all the additional fanfare. If you're looking for a quality getaway, none of these destinations shall disappoint. This little gem that sits right on the Southern Ocean on WA's south coast boasts a remarkable coastline that contrasts significantly with the topographic landscape shifting inland, where tall trees soon give way to open paddocks. However, most visitors will likely gravitate towards the excellent beaches to which Albany plays host. Serving as the perfect travel hub for the exploration of Australia's iconic Red Centre, the outback town of Alice Springs is a staple destination for any people planning to visit Uluru / Ayers Rock and its many surrounding natural and geological highlights. It's also dotted with some incredibly interesting history of its own, too. One of the key stops on the Great Ocean Road, Victoria's Apollo Bay exudes charm along with an escapist, relaxed feel. The small town sits in an idyllic location that blends together the best of coast and greenery, with the lushness of the Otways as a nearby backdrop and a wide, sweeping beach just a short walk away. Home to some of Australia's most widely-awarded wines and a verdant and rolling countryside in and of itself, the Barossa Valley can lay claim to the title of our country's preeminent culinary hub. Just a short drive from Adelaide, the Barossa is the ideal destination for a laid-back getaway, one dotted with scenic vineyards and more. Established as a result of the Australian gold rush period, yet standing the test of time to become one of our country's most noteworthy regional centres, 2016's Top Regional Destination Bendigo mixes together the historic with the natural into a single delightful package. The city has successfully incorporated modern enhancements, as well. An underrated and occasionally overlooked - yet quality - Queensland base for exploring the Great Barrier Reef's southern portions, Bundaberg is mostly famous across Australia for its signature rum, yet provides much more for the aspiring traveller in addition to being a springboard to one of Australia's greatest natural wonders. The small seaside town of Busselton to the south-west of Perth has long been popular with Western Australians, having taken the title of the state's top tourist town over the course of three separate years. Featuring a magical coastal location and famous sunsets, it's one of WA's hidden regional gems, famed for its iconic jetty. Coffs Harbour and its surrounding region has long been a hugely popular place to visit due to its position as a “midway-point” between both Brisbane and Sydney. It's far more than just a stopover destination however, as its gorgeous coastal location coupled with a huge amount of greenery make for a wonderful holiday spot. The isolated mining town situated in the middle of the South Australian outback remains one of the country's most unique travel spots. Renowned for its scorching hot temperatures that force many of its residents to seek refuge in homes underground, Coober Pedy has its own distinct sightseeing attributes and cultural quirks. One of the greater Melbourne region's true natural gems, the under-appreciated Dandenong Ranges should be a staple on every visitor to Victoria's itinerary – it's a lush range featuring a blend of dense Aussie forest, lovely walking tracks, unique attractions, and a handful of small and charming towns dotted throughout. With a focus around relaxation and getting back to nature, the area around the sister towns of Daylesford and Hepburn Springs features Australia's highest concentration of natural mineral springs – in fact, 80 of the 100-some springs in the country are located here. It thus has a well-deserved reputation for pampering. A more isolated and adventurous alternative to more famous Broome, Derby serves as a standout springboard for exploration in its own right. Perched on a rugged Kimberley coastline that is home to the highest tidal variation in Australia, it serves as the gateway to the Buccaneer Archipelago and various other WA wonders. An ever-growing destination in regional NSW with a charm all of its own, Dubbo offers visitors a range of things to see and do unique to this part of the state including key highlights. From its famed zoo to its heritage-listed Gaol and more, it's not hard to see why Dubbo ranks as a favoured getaway for Sydneysiders. This duo of towns on the banks of the Murray River owe much of their extensive and interesting history to their raw physical location on Australia's longest waterway. Paddlesteamer vessels that plied their trade from each town became symbolic of the region, and to this day it remains home to the world's largest fleet of these boats. Western Australia is home to a number of beautiful little coastal towns each with their own character and charm, yet Esperance is a standout among them. Originally discovered by the French, this is a coastal spot with beaches that are worthy of postcards that could compete with the likes of the Whitsundays on the east coast. One of the greater Adelaide region's most popular day trips, the scenic Fleurieu Peninsula blends food, wildlife, wine and weather together to make for a delightful spot just 45 minutes away from SA's capital. This is a part of the state that's draped in greenery, filled with animal life and also provides coastal and river experiences. South Australia's inner reaches are home to some of the country's most ancient and rugged terrain, with the Flinders Ranges region exemplifying this to the fullest. Rugged sandstone bluffs, dry creek beds and incredible landforms that have been moulded by millions of years of weathering await here. More than just a mere offshoot of Perth, the historic port city of Fremantle is well worth a visit in its own right, with a strong maritime history and a number of distinctive local attractions - as well as some great opportunities for food and drink. There remains a strong colonial element to its architecture to this day, as well. Located on the southern QLD coast, Gladstone is a gateway to the beautiful southern Great Barrier Reef and a haven for those pining for tropical getaways without the rampant commercialism that can sometimes plague them - a spot with a number of islands just off the coast and various wildlife reserves & conservation parks inland. A small town located in the picturesque Adelaide Hills in South Australia, Hahndorf is Australia's oldest surviving German settlement and a wonderful tourist destination for those looking for all the hallmarks of European culture within easy reach of Adelaide. It's easily accessed from the capital in just a short drive, too. Known as the unofficial "Whale Watching Capital of Australia", Hervey Bay on the central Queensland coast is a laid-back, sunny seaside destination that provides all the relaxation and aquatic-focused benefits of some of the country’s more famous, bigger-name destinations without all the excess crowds to boot. New South Wales' lush Hunter Valley is one of Australia's premier wine regions, playing host to countless acclaimed cellar doors and boutique wineries from some of Australia's biggest wine producers. The myriad vineyards and lush fields of the region give it a tranquil quality that serves to satisfy visitors' love of food, wine & scenery. Boasting a calming blend of history and modernity, Ipswich is a scenic and relaxed destination located just a short distance from Queensland's capital. A viable day trip and overnight destination, Ipswich is the perfect getaway from the big smoke full of heritage and greenery all wrapped into a single enjoyable package. This historic and far-flung mining community is both highly relevant in the present and a snapshot of the past; once the domain of literal cowboys, the town has grown on the back of the mineral industry and boasts one of the more unique characters of any regional centre in Australia. Ever wanted to pay a visit to the wild west? This verdant slice of scenic countryside offers everything one could ask for in a peaceful countryside getaway: it's relatively underrated and thus lacks excessive crowding, it's renowned for delectable produce for visitors to relax and enjoy, it's got a mild and comfortable climate, and, perhaps most importantly, it's strikingly beautiful. While the entire Kimberley region of Western Australia is worth exploring for those with extended time, focusing one's travels around the lovely hub of Kununurra in the region's far east and using it as a springboard for a range of potential intriguing travel spots and natural features provides a mixture of escapism and flexibility. A tranquil and picturesque city-town, Launceston brings with it many of the charms of historic England with all the conveniences of a larger city. A gorgeous city of lovely floral parks, a scenic waterway and plenty of interesting natural surrounds just a short drive away, Launceston is well worth the diversion from elsewhere in Tasmania. The name of both a town and the region of the area Margaret River, this is one of the true hidden travel gems not only in WA, but the country as a whole. Featuring a diversity of nature intermingled with some excellent wine country and beautiful coastline, it's a place where rocky shores, wondrous cave networks & culinary offerings all meet. This verdant, greenery-draped slice of the greater Yarra Valley region is renowned for its blend of pristine natural highlights and overall sense of tranquility; this is a land of ferny gullies intermingled with towering trees, as well as a number of gorgeous waterfalls for perhaps which Marysville is most highly acclaimed. A blend of old-meets-new within the far north-west of regional Victoria that serves as a hub of greenery and civilisation in what is otherwise quite a dry part of the country, Mildura sits alongside the banks of the mighty Murray River that brings along with it famously clear skies and warm weather, making for an idyllic getaway destination. This Queensland gem located in the Cassowary Coast region is a tropical oasis and another secluded yet viable alternative away from the larger, more populated tropical north Queensland destinations. With a small population, you'll feel like a local in Mission Beach as you lounge on the beach and stroll around the small town in the warm Queensland sun. Situated roughly a 90km drive from the Victorian capital, the lovely Mornington Peninsula is another of the state's favourite getaway spots. Famed for its delightful waterfront areas and stretches of pristine beach, the Peninsula combines stunning bay views, a host of delectable local foodstuffs and a myriad of other unique attractions. In terms of Australian historic hubs, few parts of the country have had such a wide-reaching influence on the growth and development of Australia as a whole than the Murray. The lifeblood for many outback towns, the waterway serves as an ever-present backdrop to an extensive range of excellent historic attractions. Those wanting all the warm-weather benefits of a Queensland reef and rainforest environment with even less noise and bustle than the “big two” accommodation hotspots can instead set their eyes to this fantastic - and romantic - spot nestled at the halfway point between Cairns and Port Douglas: meet the idyllic Palm Cove. Boasting the best of both reef and rainforest as well as a more secluded and high-end alternative to other Great Barrier Reef destinations, QLD's Port Douglas offers an exclusive way to explore two natural wonders from a single delightful spot. Reef wonders, pristine beachfront, some indulgent pampering and more are all here. One of Australia's best regional hubs for those seeking aquatic experiences, South Australia's Port Lincoln lies on the scenic Eyre Peninsula and serves as an ideal springboard for those who like their experiences wet and wild. Renowned for the quality of its seafood, both your eyes and tastebuds will be in their element here. The mid-NSW-coast town of Port Macquarie is far more than just a scenic stopover between Brisbane and Sydney - it's a wonderful coastal region in its own right, complete with a picturesque shoreline pocketed with sections of beautiful beach, and a lush hinterland area just begging to be explored just a short drive away. This beautiful seaside coastal destination sits just 2.5 hours north of Sydney and 1 hour north of Newcastle. Port Stephens is known for its array of wonderful beaches, massive sand dunes, pristine waters and plenty of marine-focused things to see and do. Its waters are not only pretty to look at, but also home to a bevy of marine life. South Australia's oestensible “Limestone Coast” is renowned for many things that make it an appealing travel spot, blending together beaches, cliffs, caves and all-around natural beauty, but the little seaside resort of Robe stands out for a number of reasons – from lovely coastal scenery to its signature, deliciously fresh seafood. Something of a regional New South Wales icon, Tamworth is often considered the 'perfect country town' for a multitude of reasons. Celebrating all things country music, Tamworth offers visitors the chance to enjoy a picturesque slice of Australian countryside with all the added conveniences of a reasonably large city built in. This popular South Australian oceanfront locale offers both a picturesque aspect and a historic background, as well as numerous charming arts and crafts - to go along with some bracing sea air. Having been a popular holiday destination for South Australians for hundreds of years, Victor Harbor offers plenty of great reasons for visiting. Located in central New South Wales, Wagga Wagga is the state's largest inland city with a population of more than 62,000 people and nestled amongst attractive natural surrounds. With a name recognised around the country - "So nice they named it twice" - Wagga Wagga is a viable travel destination for a variety of reasons. Situated towards the far end of the Great Ocean Road, Warrnambool couples the signature ruggedly beautiful coastlines of the region with a mixture of history, verdant farmland and a number of gorgeous beaches - as well as a strong maritime culture from its origins as a whaling community that remains fascinating to this day. In terms of raw culinary indulgence, few regions in Australia do it quite as well as Victoria's Yarra Valley. Situated less than an hour away fromMelbourne, this is a region that pays proper homage to the simple wonders of the grape with innumerable cellar doors, augmented by delectably rich cheeses and other produce. Category 3Island DestinationsVote Now The many pristine slices of sun, sea and sand off Australia's coastline. As an island continent, it's only fitting that Australia is home to some truly stunning islands that dot its perimeter. Renowned for their blend of vibrant blue waters, tropical rainforests and pristine, white sandy beaches, Australia's islands rank among the best in the world and range between populated, resort-equipped hubs through to virtually uninhabited, isolated paradises. A spot for honeymooners and those looking to truly indulge, if you're after pure isolation and exclusivity during your time on the Great Barrier Reef, then a visit to privately-owned Bedarra Island is for you. Blanketed in tropical rainforest, Bedarra Island has been repurposed into an elite-level accommodation facility. The smallest of the three sand islands off the south Queensland coast, Bribie Island is widely renowned as a fisherman's dream, and the only Moreton Bay island that can be reached via car. Located just a short 45 minute drive from Brisbane, visitors can soon find themselves relaxing in a tropical seaside locale on par with the best. Featuring dramatic and rocky sea cliffs dotted with various coves and inhabited by a wide array of wildlife, Bruny Island off the southern coast of Tasmania is an incredible concentration of nature within easy reach of Hobart. Throw in a delectable array of culinary offerings and you've got another delightful escape awaiting. A UNESCO World Heritage-listed island on the waters of famed Sydney Harbour, Cockatoo Island is an ideal day trip destination for locals and visitors alike that makes for one of the world's most unique camping spots. Reached easily via ferry, the views of the iconic harbour and its landmarks from the island are wonderful. The scenic and hilly Fitzroy Island is a popular day trip destination from the popular tourist hub of Cairns for those looking for a less commercialised environment. Located just a short 45 minute journey from the mainland, Fitzroy Island is fairly mountainous and is a great and less crowded alternative to its neighbours. Renowned for its blend of wondrous natural features that have helped contribute to its status as a World Heritage-protected national icon, QLD's Fraser Island has enough unique characteristics to help separate itself from its brethren. Mangrove forest, over 40 crystal-clear freshwater lakes, rolling dunes and more all await here. One of the largest and most beautiful islands in the southern portion of the Great Barrier Reef, Great Keppel Island is significantly developed compared to many of its neighbours. A push by locals to increase development of the island may have reached a stalling point, yet the island still remains lovely to visit. The scintillating Haggerstone Island lies around 600km north of Cairns and with its white sandy beaches, tropical rainforest, blue lagoons, picturesque natural beauty and exotic timber buildings, this small island is a magnificent holiday hotspot that's home to an all-inclusive boutique resort right on the Barrier Reef. This luxurious, upmarket Hamilton Island is a buzzing hive of activity and serves as a key springboard for adventures to explore the beautiful Whitsunday Islands. Home to an airport as well as a number of accommodations, restaurants and shopping, Hamilton Island is the ideal base for those who want to enjoy gorgeous surrounds. Heron Island, located around 80km off the coast of Gladstone, is a coral cay draped in a diverse amount of vegetation and famed for the birdlife from which it derives its name. As part of the Great Barrier Reef's southern portion, Heron Island is widely regarded as having some of the best island-adjacent reef of any on offer. South Australia's Kangaroo Island is a pristine wilderness locale just off the coast of the SA mainland and blanketed by protected national parks which take up over one third of the island's mass. Covered by stretches of rugged coastline, towering cliffs and gorgeous white sandy beaches, Kangaroo Island is surprisingly diverse. Boasting one of the world's top rankings in terms of "cleanest air", King Island in the Bass Strait off the Tasmanian north-west coast stands out as a must-visit for a number of reasons ranging from its beautiful beaches, to its tantalising seafood, to its wonderful wildlife and amazingly unique signature golf course. If you're a traveller looking for a destination that encapsulates everything a trip to the Great Barrier Reef is all about - and one that comes at a far more reasonable price while providing world-class diving experiences - then it's hard to look past Queensland's highly-acclaimed Lady Elliot Island and its incredible scuba offerings. Host to the Great Barrier Reef's largest lagoon and one of the best overall budget options for those looking to get a sampling of a quality reef environment, Lady Musgrave Island offers an amazing snorkel and dive destination - particularly for beginners - all at a relatively reasonable, and far more affordable price point. In terms of exclusivity, few Great Barrier Reef destinations can compare to the beautiful Lizard Island off the northern Queensland coast. Engulfed in pristine and secluded beaches that are considered some of Australia's most beautiful, Lizard Island offers excellent snorkelling just offshore and one of the country's most high-end resorts. Far enough from the mainland to remain almost totally untouched by man, yet close enough to remain a viable holiday destination lies the incredible Lord Howe Island. It comes with a more than justified World heritage listing, a visitor cap of 400 people at any one time, and a volcano-and-reef structure that forms a true slice of paradise. Queensland's Magnetic Island near Townsville remains something of a hidden gem in terms of island travel that allow visitors to experience the best of a destination that combines both eternally warm weather and proximity to a stunning reef environment into a single, enjoyable package - and for a highly reasonable price. The diverse and picturesque Maria Island lies just 15km off the east coast of Tasmania and combines elements that help make it unique. Blanketed entirely by national park, its natural features are obvious in terms of both beauty and wildlife, however it's the island's remarkably intact convict buildings that add an extra layer of intrigue. It's not every Australian capital city that can boast having an escapist island paradise just offshore, but Moreton Island – which lies 25 kilometres off Brisbane – is exactly that. Providing a cavalcade of nature-based activities and fun in the sun in return for relatively little investment, Moreton Island offers a bevy of things to do for families. One of the most popular natural destinations that's reachable within a reasonable distance outside Melbourne, Phillip Island is renowned as a nature destination for multiple reasons, but one in particular: its penguins. With a trip here, you'll be able to watch groups of incredibly cute Little Penguins make their way to shore every night. Sitting 19km off the West Australian mainland, the beautiful Rottnest Island is WA's take on the scenic-wildlife-filled adventure wonderland motif. As an A-class nature reserve, “Rotto”, as it's known by the locals, is home to some of the most spectacular white sandy beaches, secluded bays and its signature, incredibly-cute Quokkas. Your #1 voted island in 2016, and home to the iconic Whitehaven Beach, Whitsunday Island is the largest island in the Whitsundays and one of the most internationally recognisable. A popular day trip destination as well as a camping hot spot, Whitsunday Island offers an non-commercial, back to basics island escape with a stunning outlook. It's our belief that the role that experiences can often play as the driving force for travel in general is underrated, whether it be exploring incredible natural wonders, gaining insight into history and culture, or simply enjoying entertainment with friends and family. It's these experiences - not the flights, nor the hotel - which people will be sharing with others for years to come. Browse and book thousands of Australia's top experiences in these top destinations and others all over the country.